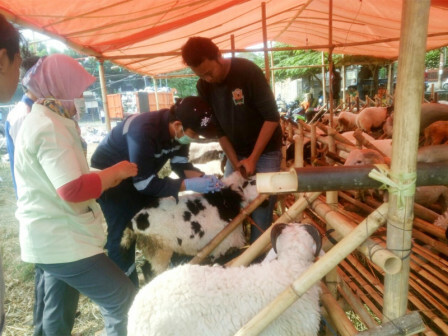 Around 25,423 qurban animals that spread in East Jakarta have been examined. It is conducted by 60 joint officers since August 1-20.
" It aims to create a sense of security and safety for the people who want to sacrifice animals"
Irma Budiany, Section Head of Livestock and Health expressed that all animals examined are from 363 shelters in 10 sub-districts. Examination itself involved 70 animal health officers of Maritime, Agriculture, and Food Security Dept. and Sub-dept., as well as Indonesian Veterinarians Association (PDHI). "Since August 1 until now, there have been 25,423 qurban animals examined. It aims to create a sense of security and safety for the people who want to sacrifice animals," she stated, Tuesday (8/21). Those 25.423 animals are consisting of 7,047 cows, 801 buffaloes, 16,384 goats, and 1,191 sheep. From that number, 3 goats are sick because of fatigue after a long journey.